With onboard Internet connections, large hard drives and extremely powerful CPU and graphics processors, today’s gaming consoles like the Xbox 360, or PS3 (and to a lesser degree the Nintendo Wii which emphasizes game play over game technology) house immense computing power. The Xbox 360, for example, runs a custom designed IBM PowerPC triple core 3.2ghz CPU chip. Put in perspective, a high end 2006 configuration of Apple’s Power Mac G5 used dual core PowerPC processors running 2.5ghz. In plain English, that’s some serious horsepower. Traditionally, games have been static. They are coded once, put on a disc or cartridge and sold as is. As a player, work through all the levels of game play, or find the hidden “Easter-egg” secrets, and eventually you’re done. The game won’t change. Dynamic Games are a different beast. They are games with the ability to expand, or evolve over time, games with the ability to change from one playing experience to the next. Today’s consoles bring the potential of dynamic games to a present reality. Imagine playing Tiger Woods Golf on your Xbox 360 or PS3. When you boot up the game, it queries ESPN, downloads the most recent scorecard of the US Open, and the course’s weather conditions to the hard drive. The game will then use that data to update the game. You’ll choose which of the top players you want to be and compete in a virtual grudge match linked to the actual standings. You’ll compete against what’s actually happened, against the other players who have made the cut. It will be a virtual game against a real scoreboard, influenced by real performances. It won’t a preprogrammed difficulty level. Every game can be a little different than the last. Similarly, imagine baseball. It’s late August and the playoff contenders are chasing October and doing battle. Like the golf example, plug in Major League Baseball 2009 and the team match-ups and statistics will update relative to the real world. Players abilities in the game will adjust based on their actual recent performances. A-Rod’s having a bad year and only batting .240? Choose the “reality setting” and his virtual character’s batting abilities will simultaneously be dropped in the game to replicate the real world data. Josh Beckett’s leading the majors in ERA? With the “reality” option checked, his fast ball may approach unhittable for your opponents. Such a game becomes fantasy baseball interactive. It’s a new kind of game play, a more immersive experience, a form of virtual reality. That’s the promise of Dynamic Gaming. The technology and the potential to fulfill this promise and make real these kinds of games is largely here today. The primary stumbling blocks are twofold. One: business licensing (MLB and Electronic Arts would need upgrades to their license agreements to allow the kind of data updates contemplated.). Second, the games developers haven’t yet caught up to the power of the consoles but that’s changing. And so are the business deals. Exemplifying the business changes, last week, to limited fanfare, Electronic Arts announced a first of kind deal with the Weather Channel (via The Weather Channel Interactive "TWCI"). That may not sound like much, and it didn’t get much press, but in the context of dynamic gaming, it is significant. 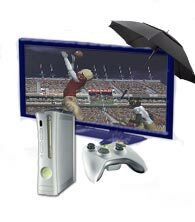 Using streamed data from the Weather Channel’s services, EA’s new college football game, NCAA Football 2008, will have the ability to match weather conditions at the game to real life conditions at the stadium. As described in the press release: "Every time a player with a live Internet connection loads a new game, they have the option to choose real-time weather from TWCI. The video game will then use the current conditions at the selected location to create the weather experience for that game." That’s Dynamic Gaming. The weather program could be classified as a pilot, a test. But mix that deal with EA’s recent partnership with Massive Networks to deliver dynamic in-game advertising for the Xbox 360 (the deal allows in-game Billboards and other graphics to be changed) and you have two experiments looking toward the future. They are both decisive steps toward making Dynamic Games a reality. Realistically, the changing billboards of in-game advertising may not make much difference to players, and a Weather component may seem more novelty than breakthrough, but the two pieces hint at what’s ahead. Dynamic games are part of the industry’s future, and the future’s here. From a business perspective, its even foreseeable that dynamic games might blaze a trail to different revenue models for publishers. It’s not a leap to imagine something like a pay-per-upgrade subscription service; something similar to the way Application Service Providers (ASPs) sometimes sell software. A gamer two years from now, might pay a subsidized price of $35 for a game (which today might have cost him or her $60). The subsidy will be justified because, beyond the game, they’ll bring the publisher a recurring revenue stream by paying an additional $50 a year in subscription fees for unlimited dynamic updates. EA’s little deal with the Weather Channel may not sound like much, but in the context of what’s to come? It could be a quiet before a big storm.